Objective: The aim of this study is to prepare and obturate the curved canals of the mesiobuccal root of maxillary first molar with four different file systems that is protaper hand files, rotary pro taper (RP) files, heroshaper hand files, and rotary hero shapers files and to evaluate the adaptation of their single-cone Gutta-percha by cone beam computed tomography (CBCT). 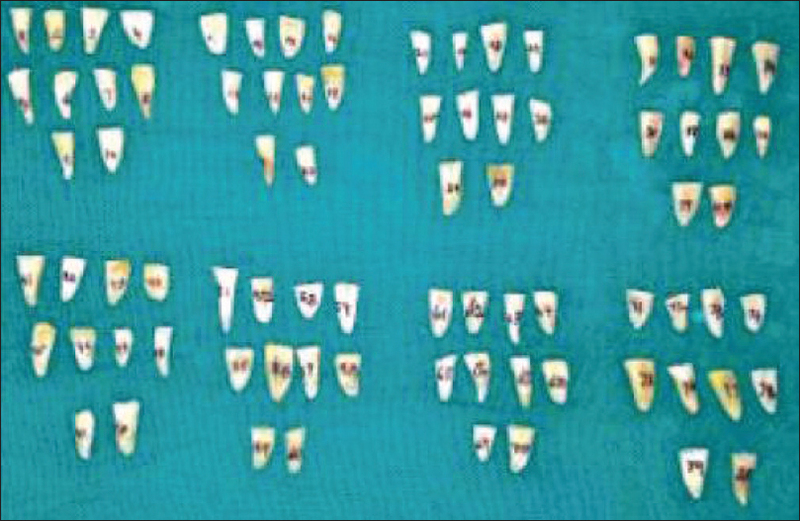 Materials and Methods: Eighty teeth were selected and were divided into two groups (G1A1, G1A2 and G2A1, G2A2 as hand and RP file system, G1A3, G1A4 and G2A3, G2A4 as hand and rotary hero shaper files system) of fourth teeth each. After access opening working length of the mesiobuccal canal was established. The distobuccal and palatal roots of the samples were removed using the diamond disc at the furcation level. “Endoanalyser” software was used to measure Schneider's angle on the preoperative radiograph. This angle was measured by drawing two lines-one parallel to the long axis of the canal, in the coronal third, and the second line from the apical foramen to intersect the point where the first line left the long axis of the canal. The canals of each group were then prepared according to the manufacturer's instructions for protaper hand files, RP files, heroshaper hand files, and rotary hero shapers files systems. Direct digital radiography image of all the samples was obtained. And then, the samples were exposed to CBCT to evaluate their single-cone adaptations. The data were analyzed using SPSS 20, IBM, Armonk, NY, United States of America. Results: The null hypothesis that there will not be any gap area in the adaptation of their single-cone of different file system was rejected. Minimal gap area was seen in rotary hero shapers file system (0.001 mm2) and was maximum in hand protaper (HP) file system (0.015 mm2). Conclusion: CBCT is a useful tool in detecting the gap area after obturation in curved canals. The HP single-cone adaptation showed the maximum gap area and rotary heroshaper single-cone adaptation showed the minimum gap area. The purpose of root canal obturation is to create a complete, three-dimensional seal of the root canal system, with the aim of preventing the recurrence of bacterial infection. This procedure should also entomb any surviving microorganisms in the root canal walls and deprive them of nutrients. This would also prevent toxic bacterial products from entering the periapical tissues. Failure of the three-dimensional seal results in the microleakage between the root canal and the periapical tissues and/or oral cavity. Numerous materials and techniques have been developed for filling root canals three-dimensionally. Gutta-percha (GP) has been the material of choice since the middle 1800s, and it remains the most popular material for obturation owing to its biologic, chemical, and physical properties. GP is suitable to be used with many obturation techniques, including lateral condensation, warm lateral condensation, warm vertical condensation, continuous wave, and injectable techniques. Because of its limitations in the physical and chemical properties, GP alone cannot create a perfect seal. In fact, a sealer is required to fulfil the requirements of a perfect seal. Similarly, as the physical properties of root canal sealers alone are inadequate, vertical, or lateral compaction of GP is required to ensure that the GP occupies most of the space of the root canal, whereas the thin layer of sealer provides the seal. A variety of new rotary files systems with their corresponding single cones have been developed which are a boon to modern endodontics. The protaper files system (Dentsply Maillefer Switzerland) and the heroshaper file system (MicroMega, France) are specially designed to provide superior flexibility and efficiency, and greater safety. The protaper system is designed to provide the fewest number of instruments that can efficiently and safely prepare a fully tapered canal. The hero shaper (micro mega) is a modification of hero 642 (The first rotary Ni ti instrument designed without radial lands). It also has the same triple helix cross-section as hero 642. The key modification in this instrument involves the pitch of the blade and the length of the cutting portion, which vary depending on the taper. The efficiency of this rotary system in postulating the adaptability of their single cones in canals had always been quizzed so to assess the efficacy of single-cone adaptation several apical microleakage studies were embarked in bygone, by several authors.,, These studies concluded that the apical microleakage in the single cone was equal to that of lateral condensation technique. In the studies conducted in the past, there were inadequate revisions on the adaptability of protaper and heroshaper single-cone GP. protaper and heroshaper are also available as hand file system, but most of the studies are only on rotary systems. Moreover, very few studies have been observed in the dental literature on cone beam computed tomography (CBCT) which has become a most valuable adjunct to the endodontist's armamentarium to evaluate the three-dimensional obturation at all the levels of the curved root canal. Hence, CBCT was used in this study to gauge the gap area created by single-cone obturation in canal walls prepared and obturated by protaper (hand and rotary) and heroshaper (hand and rotary) system in mesiobuccal canals of maxillary first molars. Therefore, the present study is conducted to determine the area filled by GP and sealer at three different levels of curvature of the root canal shaped with protaper and heroshaper system and obturated with their respective single-cone technique. 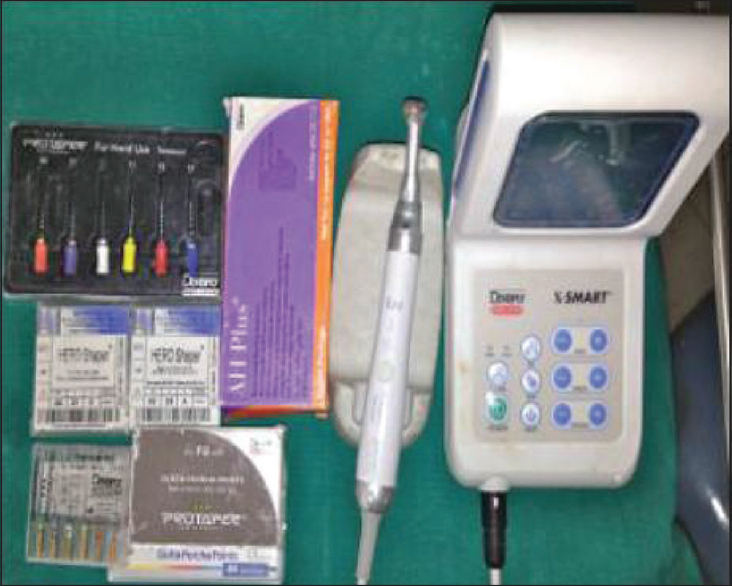 This ex vivo study was conducted in the postgraduate department of conservative dentistry and endodontics, Teerthanker Mahaveer Dental College and Research Centre, Moradabad in coordination with the Department of Oral Maxillofacial surgery. The main purpose of this study was to evaluate using CBCT the adaptation of single cone GP in curved canals prepared and obturated with hand and rotary protaper (RP) and heroshaper systems. HEROShaper gutta percha 4%(30 number 4% gutta percha cone) (Meta Biomed, Besancon, France) Calculus on the root surface of selected eighty teeth was removed by ultrasonic scalers and then was stored in 10% formalin at room temperature [Figure 2]. In protaper system (both hand and rotary) all samples were prepared till F2 (i.e., 0.25 mm with 8% taper). In heroshaper system (both hand and rotary), the yellow sequence was used. Calculus on the root surface of selected eighty teeth was removed by ultrasonic scalers and then was stored in 10% formalin at room temperature. Endo-analyzer software was used to measure the Schneider's angle of mesiobuccal roots of maxillary first molars. Preparation of root canals with hand and RP file system (Groups G1-A1, G1-A2, G2-A1, and G2-A2) was done, whereas preparation of root canals with hand and rotary hero shaper files (Groups G1-B1, G1-B2, G2-B1, and G2-B2). Both hand and rotary files were used in the below-mentioned sequence. For rotary preparation, X-mart endo motor was used. The instruments were set into rotations at a speed of 300 rpm and a torque of 2.5 Nm. An F2 protaper Ni-Ti rotary instrument is used for the canal preparation in a clockwise (CW) and counter CW (CCW) movement for both hand and rotary preparation. The F2 is used in conjunction with a 16:1 reduction ratio contra-angle connected to an ATR Vision (ATR, Pistoia, Italy) motor which allows the reciprocating movement. The CW and the CCW rotations are set on the motor at four-tenth and two-tenths of a circle. The rotational speed is set at 400 rpm. The F2 instrument is used in the canal with a slow pecking motion and an extremely light apical pressure until resistance is encountered (i.e., until more pressure is needed to make the F2 advance further in the canal). All teeth were prepared in crown down sequence to an apical size of 25 mm (F2). For rotary preparation, X-mart endo motor was used. All teeth were prepared in crown down sequence to an apical size of 25 mm (F2). Obturation of the samples prepared with protaper groups G1-A, G1-B, G2-A, and G2-B and hero shaper groups G1-C, G1-D, G2-C, and G2-D was done. A size F2 GP cone (Dentsply maillefer) was prefitted into the root canal at the working length, and fit of the cone was evaluated by direct digital images. Then, the canal was dried with paper points (Meta, Meta Dental Co., Seoul, South Korea) and A size 25 lentulo spiral (Mani, Tochigi-ken, Japan) was placed in a slow-speed handpiece and coated with AH plus root canal sealer (Dentsply Maillefer). 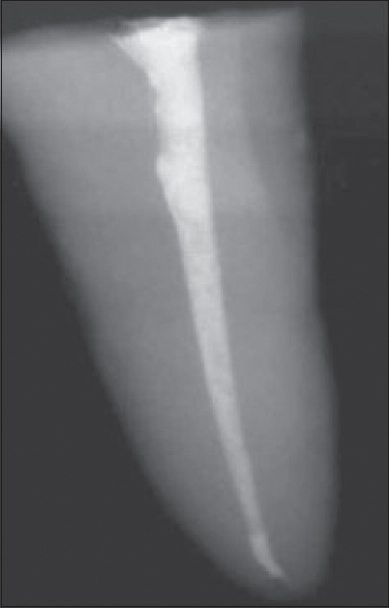 The lentulo spiral was introduced into the root canal to a location 3–4 mm short of the working length and then slowly withdrawn from the canal, with continuous rotation. Then, the cone was lightly coated with the sealer and placed into the canal to the working length. The excess GP was removed and condensed vertically with a heated endodontic plugger, and the canal orifice was sealed with Cavit-G (3M ESPE, Seefeld, Germany). Imaging was performed using the CBCT-scan (Quantitative Radiology, HATFIELD, USA) set applied for this project with a high resolution, planmeca Promax three-dimentional type CBCT system. 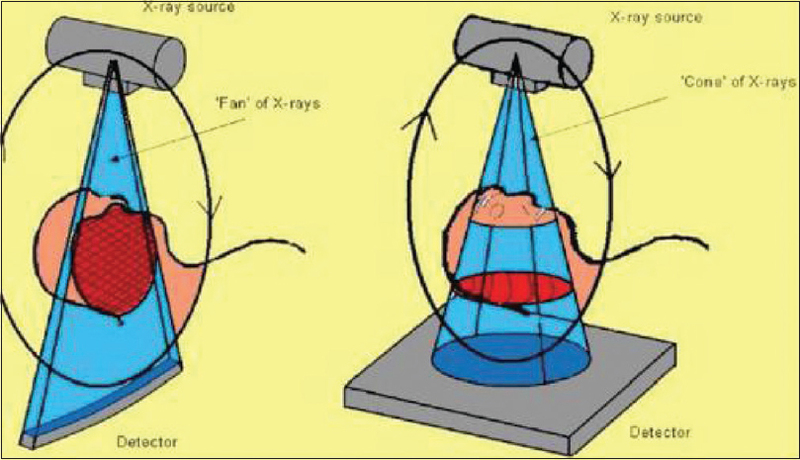 Then, the obturation of all the samples was evaluated with direct digital radiography [Figure 5], after the satisfactory evaluation of all the radiographs, the samples were evaluated under CBCT (USA, HATFIELD) [Figure 6] and [Figure 7]. The data were analyzed using SPSS Version 20 (IBM Corp., Armonk, NY). Given the data, we see that we have 5 independent variables or factors. Moreover, as such, we shall consider a 5-way fixed-effects factorial ANOVA (extended version of 3-way fixed-effects factorial ANOVA). We consider the same as a factorial ANOVA because in this case, due to the presence of higher number of factors, there shall also be interaction effects between the said variables, which we shall consider as the interaction between two factors, three factors, and four factors. In case any of the main effects of either of the factors or higher order interaction effects, we shall also consider post hoc analysis (Tukey's test) to determine or break down each simple effect for different levels of the other factors. [Table 1] shows the mean calculated value of all the samples. Hand Protaper shows maximum gap area at the level of curvature. There is maximum gap area seen in both the Hand and Rotary Protaper samples. There is minimum gap area seen in both the Hand and Rotary HeroShaper samples. In case of interaction effect between level of curvatures (above, AT and below) and protaper and heroShaper samples, at the level of curvature above gap area values in protaper samples is more as compared to heroshaper sample values at the level of curvature above (P < 0.05). Also level of curvature at AT, in protaper samples is more as compared to heroshaper sample values at the level of curvature at (P < 0.01). Level of curvature at below, in protaper samples has more gap area as compared to heroshaper sample values at the level of curvature at below (P < 0.05). This means that the gap area values at all the level of curvatures, is higher in the protaper samples as compared to the heroshaper samples. 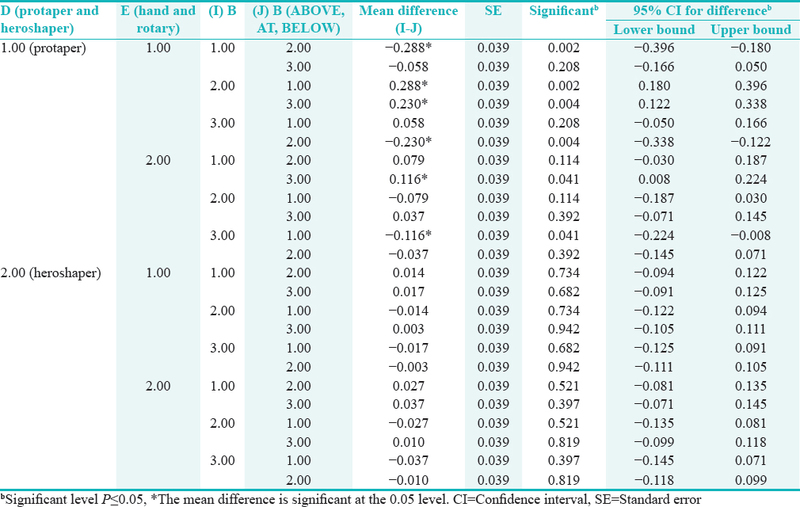 [Table 2] shows that in hand samples (irrespective of protaper and hero shaper) above (0.008) and below curvature has less values as compared to values at (0.013) curvature. No significant difference at all curvatures in rotary samples. From the [Table 3] we see that in case of interaction effect between level of curvatures (above, AT, below), and hand and rotary preparation samples (irrespective of protaper and hero shaper), at the level of curvature AT, has more values in hand prepared samples as compared to the ROTARY prepared samples (P < 0.01) At the level of curvature below, have more values in hand prepared samples as compared to the rotary prepared samples (P < 0.05). This means that at the level of curvature gap area values at AT and below, are different amongst themselves in hand preparation samples. In hand prepared samples (irrespective of protaper and hero shaper) at the level of curvature AT and below have higher gap area values in hand prepared samples as compared to the rotary prepared samples. From the [Table 4] we see that in case of interaction effect between protaper and hero shaper systems and hand and rotary preparation groups and at the levels of curvatures (above, AT, below), protaper hand preparation groups have higher values at AT level of curvature as compared to the levels of curvature at above and below (P < 0.01). Protaper rotary preparation groups have higher values at above level of curvature as compared to the levels of curvature at AT and below (P < 0.05). [Table 5] shows From the above tables we see that in case of interaction effect between between protaper and hero shaper systems and hand and rotary preparation groups, protaper hand preparation groups (0.001) have higher gap area values as compared to rotaryprotaper preparation groups (P < 0.01). There is no significant difference between hero shaperhand and rotary preparation groups. Over the last few years, endodontics has undergone a complete revolution with the introduction of the Nickel-Titanium alloy for the manufacture of hand instruments initially and then rotary endodontic instruments. The superelasticity has furthermore made it possible to carry out extremely conservative shapes, better centered, with less canal transportation and therefore with more respect for the original anatomy. To improve working safety, shorten preparation time and create a continuously tapered, conical flare of preparations advanced instrument designs with their respective single cones have been developed. This technique uses larger and thicker master cones that best match the geometry of the nickel-titanium rotary systems. The single-cone obturation technique speeds-up the root canal filling while minimizes the wedging forces applied to the root canal walls. Previously, many studies have been shepherded to evaluate the effectiveness of single cone obturation like the quality of the obturation in root canals filled with single-cone techniques was evaluated by several authors,, they concluded single cone showed better results. Wu et al. and Hörsted-Bindslev et al. evaluated the obturation quality in curved root canals by using bidirectional radiographs and the method of fluid transportation. They evaluated the single-cone and lateral condensation techniques obturation had a similar quality in curvatures of the root canals. The association of a single GP point in canals shaped with protaper and Mtwo rotary systems may provide a sealing capacity similar to all obturation techniques (Tasdemir et al. 2007). In the present study, two file systems were compared in curved canals and adaptation of GP is determined. In the present study, no criteria for cone adaptation were included in the study as compared to the study by de Vasconcelos et al. in which cone adaptation criteria was set according to the type of instrumentation. This may be due that in the present study no different instrumentation was used therefore no criteria can is applied in the present study. Clinically, the adaptation of GP was proposed to be inspected by the feeling of “tug-back” during GP cone selection. In the present study, cone adaptation is assessed by CBCT technique and degree of tug-back is not considered as compared to the study by Jamleh et al. in which degree of tug-back is determined to assess the adaptation along with the radiograph. The reason for this that CBCT is an advanced technology can give a complete idea of an adaptation of GP. Adaptability of single cone have been demonstrated using methods such as stereomicroscope (Goracci et al. in 1991),, dissecting microscope Ardila CN et al. 2003, Scott et al. 1993, linear dye penetration (Portmann and Wesselink in 1994), computerized fluid filtration meter Nimet and Hasan 2007, image analysis software bacterial leakage study, spiral CT, etc., However, none of these techniques used were precise in evaluating the adaptability of the single GP cone. As there are limited studies comparing protaper system with these newer heroshaper systems, the present study was conducted to evaluate the adaptability of single cones of protaper and heroshaper in mesiobuccal canals of maxillary first molars as they provide condition close to the clinical situation as compared to simulated canal using resin blocks. CBCT, one of the spanking noninvasive and reliable impending tool with innovation of tomographic imaging systems have been used in very few studies. CT images actually provide a radiographic appearance of the sample and do not determine the boundaries of the gap with 100% accuracy. Therefore, in this study, to address this problem, we increased image contrast to differentiate the filling and then magnify the gap area, which was analyzed by the software. Furthermore, no histological staining or sectioning of samples are required to perform this technique. With the contraction of these up-to-the-minute NITi instruments, the most conjoint problem of negotiation of the curved root canals has been deciphered. As some degree of canal curvature is present in most of the teeth of human dentition. This curvature makes endodontic preparation of the root canal system difficult. Canal curvature was initially appreciated by Schneider67 in1971 by simply categorizing roots as straight (5° and less), moderately (10°–20°) or severely (>20°) curved. It has been reported that instruments with progressive taper can shape canals more quickly than constant taper instruments. The present ex vivo study findings suggest that file design is the key factor for triumphing fruitful obturation with their respective single cones. Heroshaper with a helix angle which increases from the tip to the shank, and this had been claimed to reduce threading, while the pitch varies according to the taper with a reported increase in efficiency, flexibility, and strength with their corresponding single cones in tallying with their progressive taper succors to maintain the original anatomy of canal and paraded greatest adaptation of their single cones to the canal wall stemming in virtuous obturation. In our study, curvature (< and >10°) has no effect on adaptation of single-cone GP similar results were also reported by Sonntag and Lohmann 2003. While comparing single-cone adaptation in both HP and RP, RP was less adapted as compared to HP at above the level of curvature (Stats [Table 3] P < 0.01). This difference in the adaptation of single cone in RP at above the level of curvature may be due to increased torque in RP as compared to HP tends to transport toward the furcation in the coronal part of the canal. The fact that canal transportation occurs with protaper file may be because of variable taper along the cutting surface of these files in combination with sharp cutting edges because of their cross-section design. While comparing single cone adaptation in both HP and RP, HP was not properly adapted at below the level of curvature. This difference may be due to the difference in the instrument design, i.e., progressive taper. In the progressive protaper system (Dentsply Maillefer, Ballaigues, Switzerland), the shaping files (S) have an increasing taper from tip to coronal, whereas the finishing files (F) have a decreasing taper. The increasing taper instruments have enhanced flexibility in the middle region and at the tip, and that the decreasing taper instruments provide a larger taper in the important apical region but make them stiff. The large taper of the instrument increases the stiffness of the tip, and hence the use of larger and greater taper instruments in moderately to severely curved canals results in more gap area of the canal. As adaptation of GP is very important to the success of root canal treatment and to avoid root canal contamination which is a challenge to a practitioners in curved canals; therefore, the present study helps in improving the quality and success rate of treatment provided to patients and with the use of advance systems decreases the complications associated with root canal treatment. Only two systems (protaper hand files, RP files) is compared in the present study, various other systems when compared can give better results. Future studies can be conducted with various other file system and setting criteria of cone adaptation with different instrument techniques and keeping in mind other factors such as canal cross-section (ovoid, oval, etc.,), the degree of tug-back. This ex vivo study, conducted to evaluate the adaptation of single-cone GP in curved canals prepared and obturated with protaper and heroshaper systems by using CBCT, revealed that no significant difference in adaptation of single cones of all the four groups (protaper hand and rotary and heroshaper hand and rotary) was seen with respect to change in canal curvatures, i.e., <10 or >10°. Above the level of curvature minimum adaptation of single cone was seen in RP group as compared to HP group and hand heroshaper and rotary heroshaper groups. AT and below the level of curvature minimum adaptation of single cone was seen in HP group as compared to RP group and hand heroshaper and rotary heroshaper groups. In HP group and RP group, significant difference was observed in the adaptation of their respective single cones at all the level of curvatures. (above AT and below) Both hand heroshaper group and rotary heroshaper group revealed the greatest adaptation of their respective single cones at all the level of curvatures. (above, AT, and below). Andréa CP, Celso KN, Lidiane de CP. Comparative study of apical sealing ability of a new resin-based root canal sealer. RSBO 2012;9:442-7. Marciano MA, Ordinola-Zapata R, Cunha TV, Duarte MA, Cavenago BC, Garcia RB, et al. Analysis of four gutta-percha techniques used to fill mesial root canals of mandibular molars. Int Endod J 2011;44:321-9. Whitworth J. Methods of filling root canals: Principles and practices. Endod Top2005;12:2-24. Guelzow A, Stamm O, Martus P, Kielbassa AM. Comparative study of six rotary nickel-titanium systems and hand instrumentation for root canal preparation. Int Endod J 2005;38:743-52. Tasdemir T, Yesilyurt C, Ceyhanli KT, Celik D, Er K. Evaluation of apical filling after root canal filling by 2 different techniques. J Can Dent Assoc 2009;75:201a-d.
Dalia MF, Nihal ES, El-Said MA. 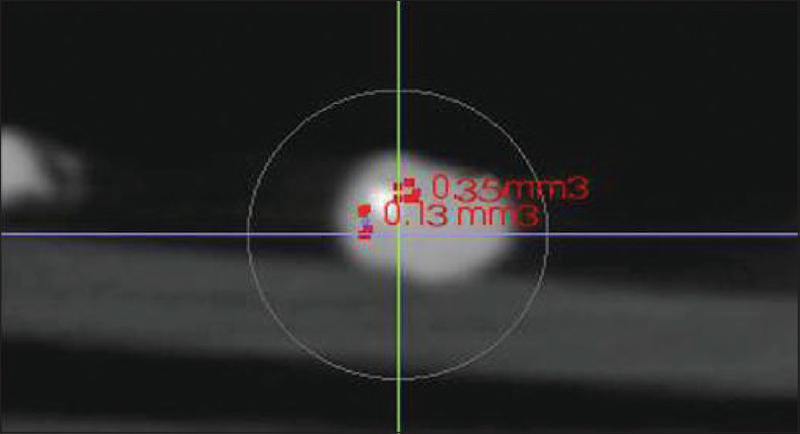 Computed tomographic evaluation of the apical shaping ability of Hero Shaper and Revo-S. Endo (Lond Engl)2012;6:119-24. Damasceno JL, Silva PG, Queiroz AC, Oliveira PT, Pereira KF. Comparative study of the apical sealing in root canals obturated by the single cone techniques Protaper and thermoplastic TC system. RGO 2008;56:417-22. Holland R, Murata SS, Tessarini RA, Ervolino E, Souza V, Dezan E Jr. Marginal leakage after filling of straight and curved root Canals by the lateral condensation and single cone technique influence of the type of sealer applied. Rev Fac Odontol Lins 2004;16:7-12. Inan U, Aydin C, Tunca YM, Basak F.In vitro evaluation of matched-taper single-cone obturation with a fluid filtration method. J Can Dent Assoc 2009;75:123. Wu MK, Bud MG, Wesselink PR. The quality of single cone and laterally compacted gutta-percha fllings in small and curved root canals as evidenced by bidirectional radiographs and fluid transport measurements. Oral Surg Oral Med Oral Pathol Oral Radiol Endod 2009;108:946-51. Hörsted-Bindslev P, Andersen MA, Jensen MF, Nilsson JH, Wenzel A. Quality of molar root canal fillings performed with the lateral compaction and the single-cone technique. J Endod 2007;33:468-71. Vasconcelos RA, Camargo CH, Cavalcanti BN, Manhães LR Jr., Gonçalves SH. Adaptation of gutta percha to oval canals: A cone beam computed tomographic analysis. Gen Dent 2017;65:e13-7. Yoon H, Baek SH, Kum KY, Kim HC, Moon YM, Fang DY, et al. Fitness of gutta-percha cones in curved root canals prepared with reciprocating files correlated with tug-back sensation. J Endod 2015;41:102-5. Jamleh A, Awawdeh L, Albanyan H, Masuadi E, Alfouzan K. Apical guttapercha cone adaptation and degree of tugback sensation after canal preparation. Saudi Endod J 2016;6:1315. Goracci G, Marx D, Covey D, Karmazin M, Lavin M, Gound T, et al. Percentage of canals flled in apical cross sections – An in vitro study of seven obturation techniques. Int Endod J 2004;37:392-8. Gordon MP, Love RM, Chandler NP. An evaluation of. 06 tapered gutta-percha cones for filling of. 06 taper prepared curved root canals. Int Endod J 2005;38:87-96. Ardila CN, Wu MK, Wesselink PR. Percentage of flled canal area in mandibular molars after conventional root-canal instrumentation and after a non instrumentation technique (NIT). Int Endod J 2003;36:591-8. Scott D, Wu MK, Wesselink PR. 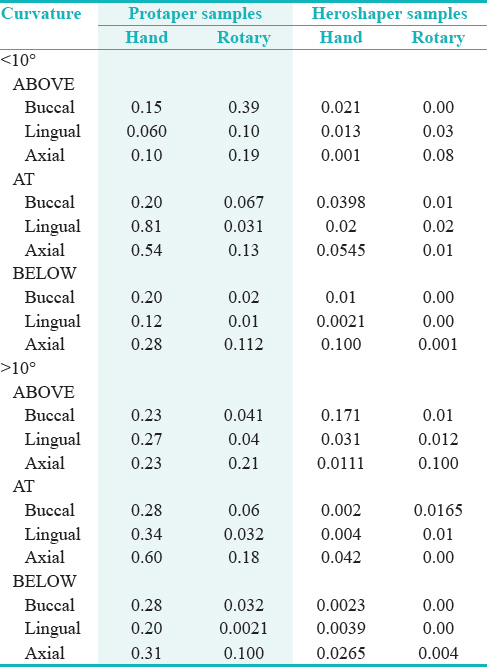 Percentage of filled canal area in mandibular molars after conventional root-canal instrumentation and after a non instrumentation technique (NIT). Int Endod J 2003;36:591-8. Portmann P, Wesselink PR. Effect of sealer thickness on long-term sealing ability: A 2-year follow-up study. Int Endod J 1997;30:307-12. Gençoglu N, Oruçoglu H, Helvacıoḡlu D. Apical leakage of different gutta-percha techniques: Thermafil, JS quick-fill, soft core, microseal, system B and lateral condensation with a computerized fluid filtration meter. Eur J Dent 2007;1:97-103. Ozawa T, Taha N, Messer HH. A comparison of techniques for obturating oval-shaped root canals. Dent Mater J 2009;28:290-4. Cathro PR, Love RM. Comparison of MicroSeal and system B/Obtura II obturation techniques. Int Endod J 2003;36:876-82. Dawood AA, Mozzo T, Whaites E. The potential application of cone beam computed tomography in the management of endodontic problems. Int Endod J 2007;40:818-30. Veltri M, Mollo A, Mantovani L, Pini P, Balleri P, Grandini S, et al. 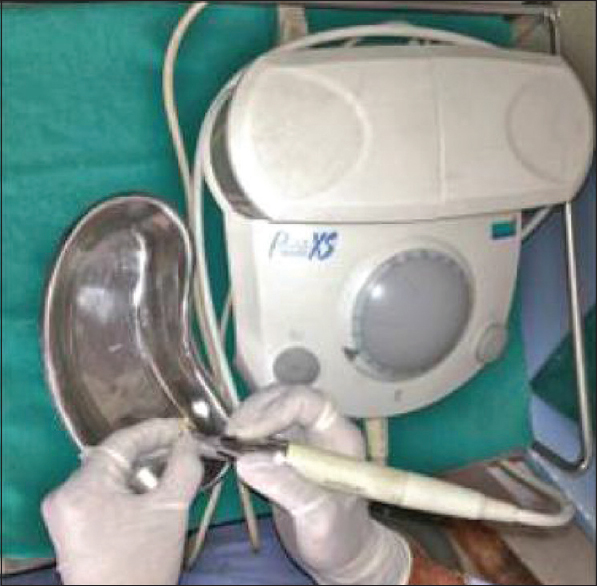 Acomparative study of Endoflare-Hero shaper and Mtwo NiTi instruments in the preparation of curved root canals. Int Endod J 2005;38:610-6. Schäfer E, Lohmann D. Effciency of rotary nickel-titanium Flex Master instruments compared with stainless steel hand K-flexofle – Part 1. Shaping ability in simulated curved canals. Int Endod J 2002;35:505-13. Sonntag D, Lohmann D. Efficiency of rotary nickel-titanium FlexMaster instruments compared with stainless steel hand K-flexofile – Part 1. Shaping ability in simulated curved canals. Int Endod J 2002;35:505-13. Ponti TM, McDonald NJ, Kuttler S, Strassler HE, Dumsha TC. Canal-centering ability of two rotary file systems. J Endod 2002;28:283-6. Sonntag D, Guntermann A, Kim SK, Stachniss V. Root canal shaping with manual stainless steel files and rotary Protaper files performed by students. Int Endod J 2002;35:514-21. Zhu Y, Gu Y, Du R, Li C. Root canal preparation of Protaper instruments in curved curvature teeth. Int Chin J Dent 2003;3:118-21.